After yesterday's little ride I decided that it was time the bike had a bath to make it look a bit more respectable. So a quick scrub up and then back into the shed to rest up for next weekend. By the time we'd left my place and I'd gassed up a few spits of rain were starting to warn us of what was on it's way. Leaving Palmy we headed out Aokautere and turned off to head over the track. By now it was starting to rain and the road was getting pretty wet. We climbed up and over the track and Mark pulled over for a bit of a conflab and a pitstop (Woolworths bladder). 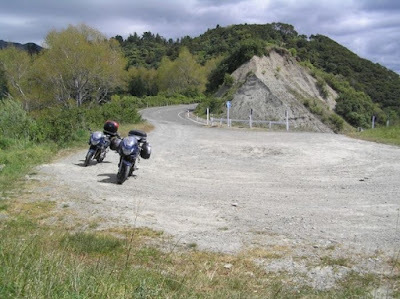 We decided to head onto Pahiatua and see if the weather was clearing so we could go for a decent ride. While mucking around a GS500 went past two up - we weren't the only idiots out in the rain. Once in Pahiatua we pulled over where some other guys had stopped for a coffee and had another conflab. The decision was to head home and get out of the rain so off we went again. Made pretty good time until we got caught in some traffic before Woodville but then had a pretty good run through the gorge and home. Not the best conditions for an enjoyable ride but better than sitting around home doing nothing. Trip distance approx 85km and yep, the bike is filthy again! After expecting the weather to be a bit unfriendly (forecast was not flash) it was nice to be surprised by a really nice day in the Manawatu. By 1pm I'd had enough of doing the boring stuff around home and it was time to get the bike out. I decided on just a quick trip around the Pohangina Valley and set off for Fielding wondering if I should get some gas there - my last fill had been in Hastings last weekend. When I hit Fielding I decided that I probably had enough and that I'd be able to fill at Ashhurst on the way home, so off I went. Leaving Fielding the first 26k's or so to Kimbolton are pretty straight and boring but once you turn off at Kimbolton you start to get into some better biking territory - plenty of corners and some great little hills. The stretch to Apiti was a great little warm up. Turning into Pohangina Valley East Road I hit the first lot of new seal so started keeping my eyes peeled even more at each set of corners. This was just the start of the messy roads - there were a number of sections of un-signposted new seal. There was also a number of places where slips had been down over the road and of course plenty of mud thrown of tractor tyres. This is pretty par for the course through here in winter but it would be good if the road works at least were signposted. This was also the only place were I saw another bike out and about (a black M109), I dunno where everyone else was? Once past the turn off to Pohangina the roads improved and I was able to have a bit more fun blasting back into Ashhurst. When I hit there I still had plenty of fuel so I carried on back to Palmy. This hard ride starts off on the 2005 Rusty Nuts Southern Cross. After having a great trip around the South Island and completing the first two checkpoints (Bluff and Cape Reinga) there were only two to go before heading home. Check point three was at East Cape and this involved riding from Te Araroa to the Cape and back on a mostly gravel road. This was a bit of blast but once back on the tar and heading over the hill to Hicks Bay the bike started misbehaving in the corners - it was sliding all over the road. I quickly realised that the rear tyre was going down and turned off into Hicks Bay and parked up at the store. Here we confirmed the diagnosis and pulled a small piece of wire out of the tyre. Now what? In the bottom of my pack I had an old tyre pando that I'd had for at least 15 years and never used. We whacked this in and were loaned a foot pump (brand new, off the shelf) by the good folk at the shop which we used to put plenty of pressure in the tyre. Things looked pretty good - no goop or air leaking out the hole but I was looking at a 200km ride back to Whakatane to get the tyre repaired - would it hold the whole way? What if it didn't - would I get to that last checkpoint at Cape Egmont by 12pm the next day? Was I doomed to bomb out on my first Southern Cross? I started off taking things really easy - especially in the corners - expecting the repair to let go at any stage. After about the first 20km or so everything was still all good so I upped the pace a bit. After all it was either going to let go all at once or go down slowly - may as well get as close to civilisation as possible. Miraculously I made it into Opotoki where I went into the first garage I saw to check the tyre pressure. The repair was holding up awesomely well - I didn't even put any more air in it! Now to get to Whakatane and get the tyre fixed properly. We got into Whakatane at around 2pm and found the local Suzuki shop (Underwood & Wilkins) and they set to work on the puncture. By the time Mark & I had a late lunch they were finished and we were ready to hit the road again - but not before visiting Repco for another tyre pando, after all that first one had proved to be a good investment. We made it into Te Kuiti by about 7pm and knew that we had the ride beat. Sure enough, no more dramas - just a quiet ride down to Cape Egmont, pick up the badge and off home. Mission accomplished but not without a little drama! This damn tyre is cursed! I can't remember exactly where we'd been but we were coming back from Wanganui and we'd taken some of the back roads out behind Marton and ended up on the gravel. We'd just got back onto the tar again and the rear end got that wayward feeling - oh no, not again. I limped it into Marton and pulled into a garage. Whipped out the month or two old tyre pando and stuck it in. I then pumped the tyre up pretty hard and we hit the road home. This time I'd either done something wrong or the hole was just to big for the pando to seal (or maybe the pando was just too damn new). Every now and again Mark could see a squirt of sticky goo shoot out of the tyre and he was wondering if we were going to make it home. I was pretty oblivious to this and kept on going. Never the less I wasn't going to trust that tyre again and it was off to the bike shop for a new one first thing Monday morning. Oh and a tubeless tyre puncture repair kit which lives permanently under my seat - I hope I never have to use it! Got conformation of my entry into next years Pork Pie run from the Rusty's this morning. 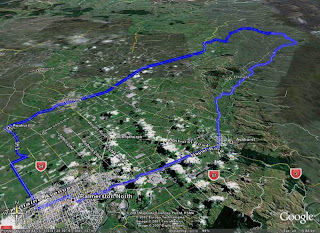 19-March 08:00 Start at Invercargill Cemetery with check points at Dunedin and Cromwell and an over night stop at Greymouth. 20-March 08:00 Greymouth to at least Picton via Christchurch. We will possibly come back to Palmy that night. 22-March 07:00 Wanganui to Kaitaia via National Park, Pokeno, and Fort Street Auckland. Looks like we will need to get planning. Need to look at Ferry times and book some accomodation. I've been on annual leave this week, so thought it was time I took a break from the home chores and took the horse out for some fresh air. The weather wasn't looking the greatest but the forcast was telling me it was going to be ok. So I set off about 9am heading south, a quick fuel stop at Shannon then it was off again and out onto State Highway 1. All the while the weather seemed to be looking wet further south but once past Otaki things started to improve. 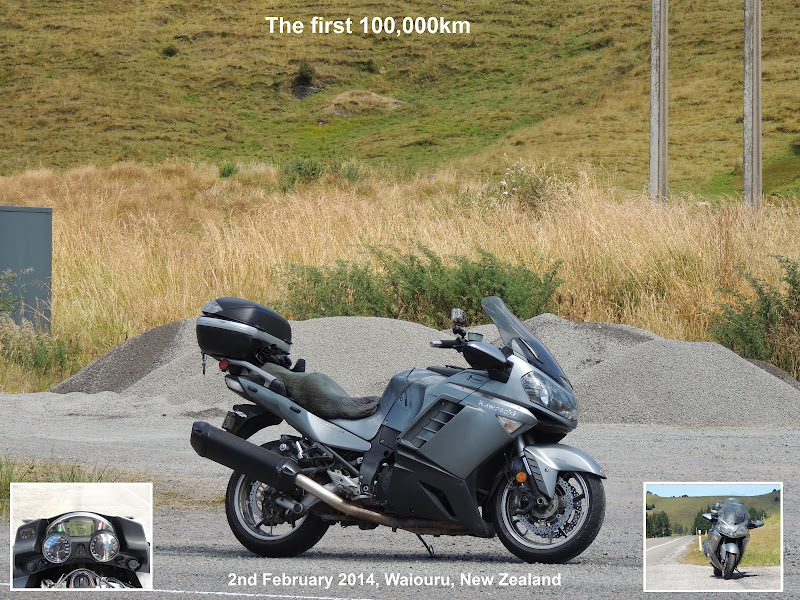 Took the Paekakariki Hill Road then over the Haywards hill to Lower Hut. Then left and up and over the Rimutaka's. This was the first time I've done this hill with a dry road so I could have a good crack at it without having to worry about a slippery road. Called in at the bike friendly Wild Oats Cafe in Carterton for lunch. They even have a free visor washing station set up. After lunch I made my way back to Palmy via Mangamaire and the Pahiatua track. Had to negotiate a bit of rain just past Eketahuna but nothing too bad. Back in Palmy by 1:30pm not sure of the distance about 300k's maybe a little more. Shame a Merlin V-12 had to die for it (what does one sixth of a Merlin sound like?) but a pretty hard case idea. I can also remember seeing a Merlin powered car on Top Gear once - apparently the owner got sued by Rolls-Royce for putting their badge on the front of it. Just picked up the July Two Wheels and they've published another one of my photos - that makes three now. This one was taken on the Manawatu Ulysees Four Points Compass Ride and was taken on the East Cape road just above Hicks Bay. The weather hasn't been the friendliest for blatting lately but you gotta keep ya hand in regardless. Saturday was my ma's birthday so I thought I'd better head up to Napier to deliver here pressie in person. Leaving Palmy bathing in a reasonably sunny sort of day I was soon in some pretty serious murk going through the gorge. The wet and sticky mist hung around all the way through to Danniverke and it was nice to see the sun again. All the way up the roads were wet and I was interested to see what sort of damage the last week's heavy rain had done to the roads. There was obviously plenty of flooded paddocks and the some of the ditches on the side of the road were pretty full and had overflowed onto the road in places. At least there were no slips "over the hill" on highway 50 which I always enjoy riding but there had been a few around Maraekakaho but all were sign-posted and mostly cleaned up. After scoffing some hot soup at the old's it was time to head back and dad decided to potter back some of the way with me as his bike hadn't had a run for a while. Every cyclist in Hawkes Bay was out on the road from about Maraekakaho to Tiko and the idiots thought that it was quite ok to be taking up all the road forcing other vehicles to stop and go around them. Some of them must have a death wish - it'd be so easy for a car or bike to come around a corner at 100k's and take a whole bunch of them out. Just north of Tiko we had a bit of a fright when we came up out of a hollow and a cop was coming the other way. He pulled over and did the big 180 but decided against nabbing us when he saw that there where two of us. Parted company with the old man at Tiko and then had another heart attack further up the road when yet another cop came out of nowhere. Mustn't have had his radar on as he didn't even waggle a finger at me. Well, I guess everybody has to leave home at some stage and at least I had my trusty steed (the mighty RG) to carry me and my gear off. I left Napier on a reasonable day but by the time I hit the Takapau Plains the winds were blowing gale force. The poor little RG only weighed about 130 odd kg and even with a heavy pack on was getting blown all over the show. I ended up crossing the plains at about 35mph with the bike hardly ever vertical and getting hit by some pretty good gusts that would have me wobbling all over the place. Somehow I got off the plains and into some slightly more sheltered conditions but by the time I got to Woodville I was feeling pretty stuffed so I pulled over for a breather. And naturally the first thing that happened was the bike blowing over. Eventually I got it on 2 wheels and just stood there leaning against it to keep it blowing over again. Finally, when I had my breath back I had to carefully climb on board, get the stand up, kick the bike over, engage gear and pull away without toppling over again. I somehow managed this and had no more trouble the rest of the way. It's funny how when you're pretty inexperienced small things like this can really stuff you up. Nowadays in a similar situation with the Bandit loaded with gear etc, I just wouldn't get in the same situation - you always check the lay of the land before you park up and the weight of the bike helps in the wind. Never mind, you've gotta learn from your experiences eh? Have just spotted something I'm keen on and could be looking to change bike a bit before initially planned. So I've stuck and add on Kiwi Biker (see link below) and if I get manage to sell or can swing a good deal then I may end up with a new horse in the shed (not telling what it is yet).